Getting ready to launch the first rocket of the day. Rocket was easy to find in the short grass. Setting up for last water rocket launch of the day. Conditions: 5 - 15km/h , ~20C, blue skies, partly cloudy later. This is only a quick update mostly for completeness. 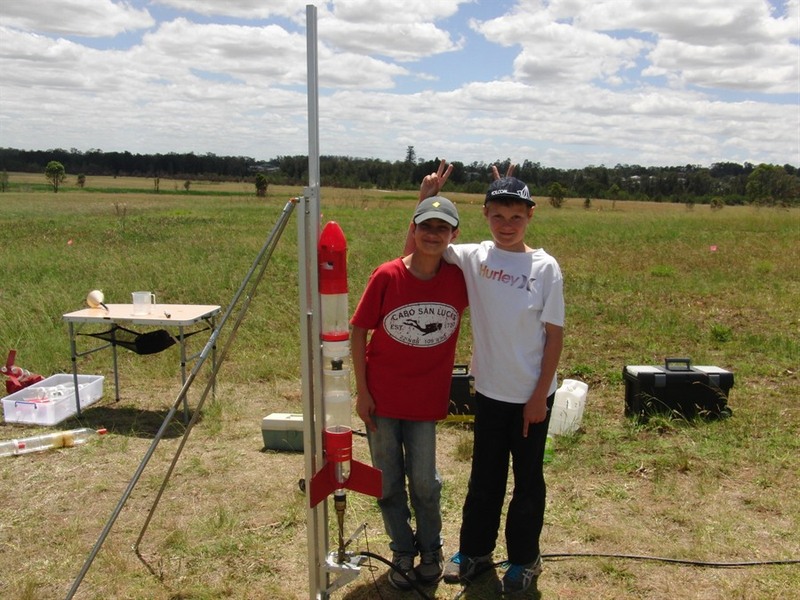 With dad away overseas this week we brought along one of Paul's friends to come and help us prepare and launch rockets. 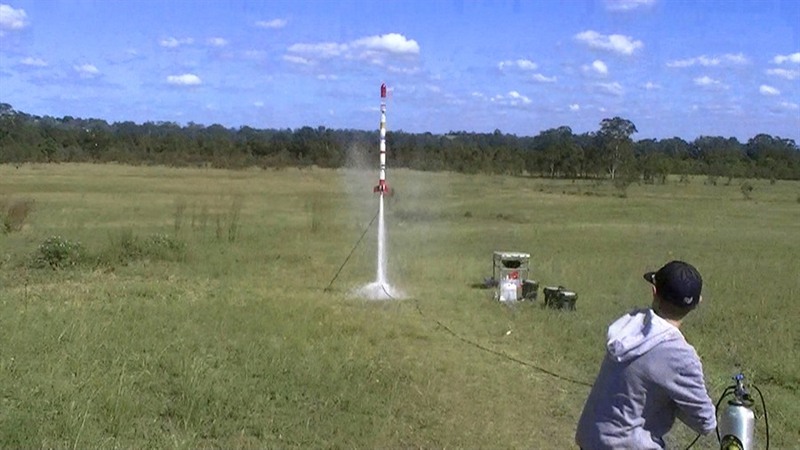 It was his first time out to the range so we launched both water and pyro rockets. We launched 3 different types of water rockets; a medium one with foam, a long one with just water, and a small one with a large nozzle. 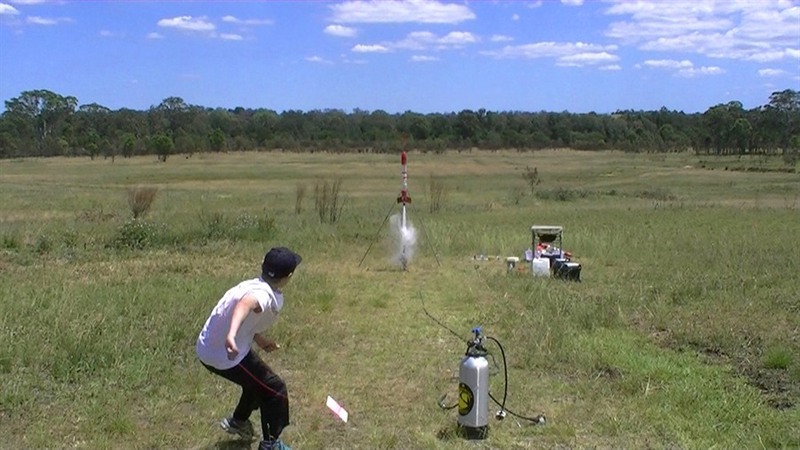 This covered the acceleration range of water rockets nicely. All the rockets flew successfully. The day before launch John and I put together the rocket Paul won in the rocket competition a few months ago. There was no point in just letting it sit in the box. 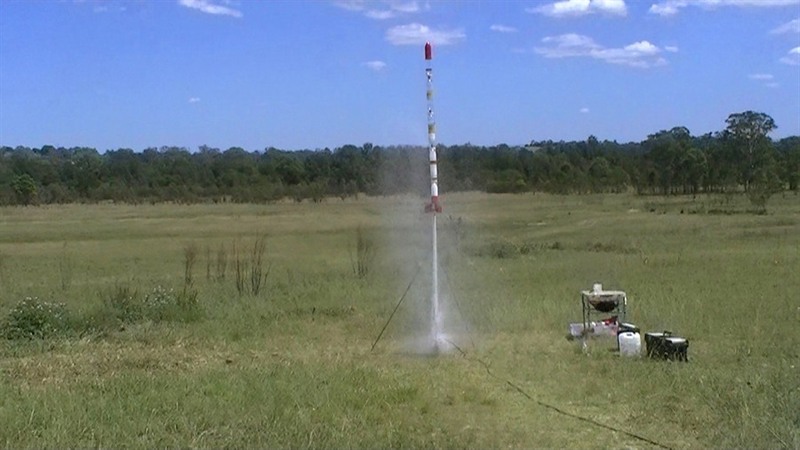 The hi-flier is a kit made by Estes. We launched the high-flier, now renamed by John to "Buzzard" on the biggest motor we could fit in which was a C6-5. The altitude on the packet says around 1600' on this motor. I figured we had a 50-50 chance of getting it back. 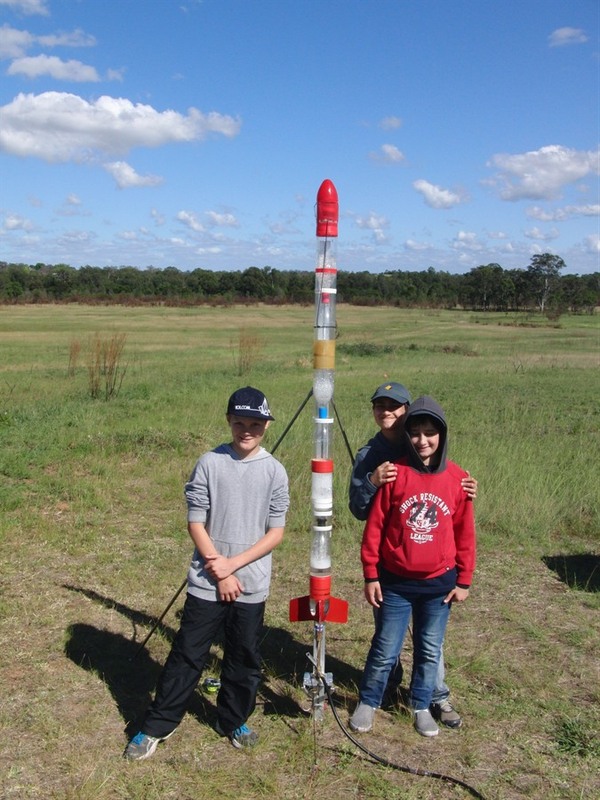 The rocket flew well and we could see the smoke trail all the way to apogee and see the ejection charge go. It was very difficult to see at that range but we were able to track it as it was coming down. Thankfully there were a few clouds in the sky which allowed you to focus your eyes at that range. The rocket drifted further and further away and the last few hundred feet I could only see the faint flashes of light as the rocket tumbled reflecting the sun off its fins. The rocket landed beyond the tree line. The 4 of us went looking for it in the tall grass but walked right up to it! 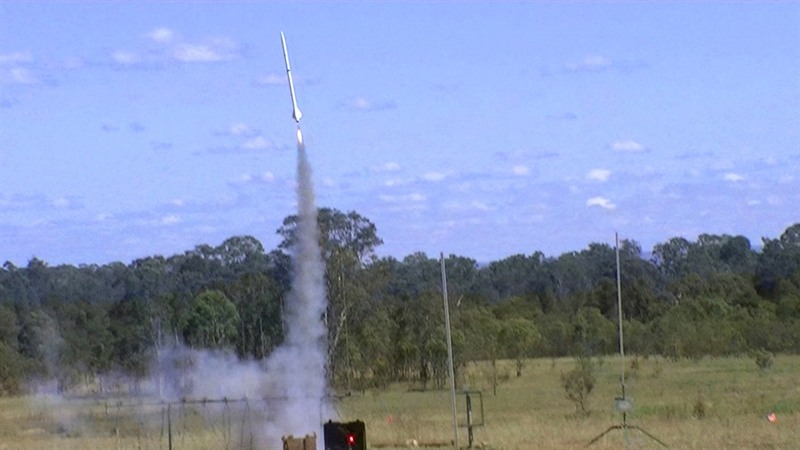 We also launched "Waterless" on the other F20-7W we had saved from the last launch and again it flew nice. This time it landed closer and was easy to retrieve. Paul's "Flygon" flew great on the D12 but came down fast under streamer and hit the ground buckling the lowest portion of the BT. This will need to be fixed before next launch. We may also replace the streamer with a small parachute. No video this week as there really wasn't anything special about these flights. Notes Good flight with good deployment although the parachute took a while to fully inflate. Good landing. Notes Good flight, with deploy right near apogee. 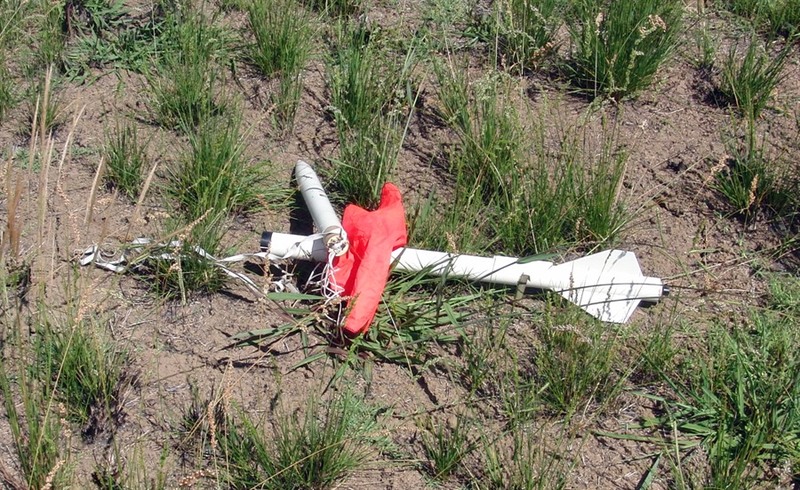 Landed ~500m downrange. Notes Good flight with good deployment. Good landing. Notes Good flight, with deploy right near apogee. came down fast under streamer and was damaged when it hit the ground. Notes Good straight flight, with deployment right near apogee. Appeared to come down sideways. Drifted a long way beyond the tree line. No damage. Notes Good flight with fast take-off good deployment. Good landing.